I am a huge lover of suspense, so I was excited to see this book coming out by my friend, author, and agent, Linda S. Glaz. While she's written many books over the past few years, suspense has always been her heart, and this book has been percolating in the back of her mind for all those years. So here's the blurb, and we'll chat on the other side! Rochelle Cassidy has the perfect life as a radio talk show host in the Detroit market, but her celebrity status doesn't stop an angry listener from wanting her ... dead. Ed McGrath's ideal life as a pro-hockey player doesn't include a damsel in distress until the night he discovers Rochelle being attacked in a deserted parking structure. Circumstances throw them together in more ways than one when Rochelle's producer plays matchmaker. A sick boy, a corrupt politician, and questionable medical practices put more than merely Rochelle in danger, and still, her attacker shadows her every step. Will Ed be able to break through her trust issues in order to protect her, or will she continue to see him as Detroit's bad boy athlete? Her life AND his depend on it. This book starts as what appears a simply suspense but quickly thickens into something much deeper. While Rochelle and Ed remain the main characters throughout, other POVs are introduced--both good and bad. Stories converge from all angles, and Glaz handles winding their plots together seamlessly. And while there were aspects avid suspense readers might decipher early, the suspense writing is strong and entertaining, as is the romance thread. Rochelle and Ed are two characters who start at opposite ends of the spectrum and are allowed to grow both individually and as a couple. This was an angle I enjoyed. A read I thoroughly enjoyed, I'm glad Linda S. Glaz finally dove into the suspense market and look forward to many other books by her! 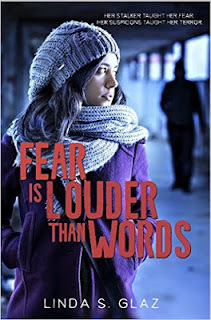 You can purchase Fear is Louder Than Words here. Thanks so much for reviewing this, Susan. I really appreciate it and am so happy that you enjoyed it!